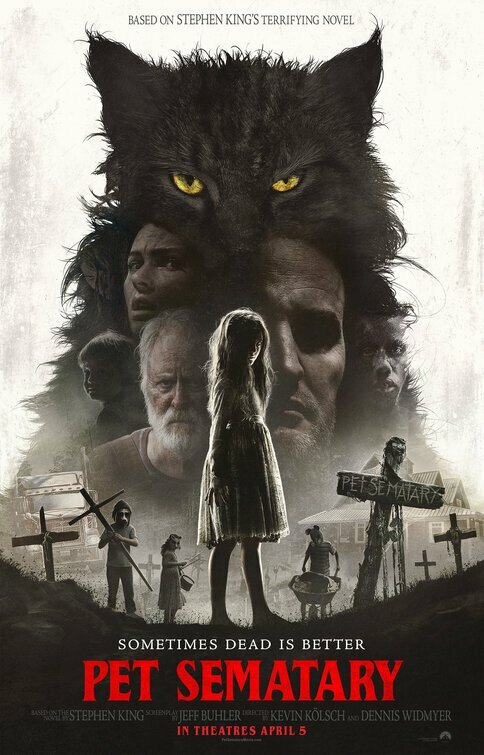 "Disturbing, Unsatisfying, Gruesome, and Abhorrent Horror Remake"
The 2019 remake of PET SEMATARY, a 1983 novel by horror writer Stephen King, tells the tale of an atheist doctor who finds a heap of trouble when he resurrects the dead body of one of his beloved children by burying it in a spooky, demonic wilderness area that even the local American Indians have shunned. Like its previous incarnations, PET SEMATARY is a dark, disturbing, depressing, unsatisfying movie with an occult worldview, strong foul language, and gruesome violence that’s excruciating to watch. When he published his 1983 novel PET SEMATARY, bestselling author Stephen King claimed the novel’s basic plot was, personally, the scariest thing he’d ever written so far because it was about a father trying to resurrect a beloved child who died. Though the novel has many defenders, it really was rather disappointing and resulted in a mediocre, though financially successful, horror movie in 1989. The 2019 remake of PET SEMATARY changes some major plot details and leaves out a couple of the more interesting developments in the book and the original 1989 movie. It still has a very dark, though different, ending, however. In the story, an emergency room doctor moves his wife, young daughter and two-year-old son from Boston to a rural community in Maine. His wife is haunted by the death of her older sister years ago. Though she believes in a Heaven, the doctor is an atheist. On the first day in their new home, the family discovers the local children have a cemetery for their pets in the woods behind the family’s house. A large makeshift wooden dam at the back of the pet burial ground prevents anyone from wandering further into the woods. The family becomes friends with their neighbor, an elderly widower who’s lived in the house next door all his life. When the family’s beloved cat is killed by a speeding truck, he takes the doctor behind the wooden barrier to a foggy, spooky precipice overlooking the large wilderness valley. The neighbor instructs the doctor to bury the cat in the ground, which is really a demonic wilderness area that even the local American Indians have shunned. The next day, the cat returns alive, but it returns with a nasty disposition. The doctor tries to get rid of the cat by dumping it across town, but it returns on the day of the daughter’s birthday celebration. The daughter sees the cat in the road and tries to get it, but an accident involving a speeding truck results in her death. Will her distraught father ignore the warnings of his neighbor and try to bring his daughter back to life? Like its previous incarnations, the 2019 remake of PET SEMATARY is a dark, disturbing occult tale. One might think that’s a perfect tone to set for a scary horror movie about supernatural things, but actually it’s rather depressing and unsatisfying. Also, it doesn’t help matters that the basic story doesn’t make much sense. In addition, though Jon Lithgow does a good job as the kindly neighbor, neither the doctor nor his wife are very sympathetic. First, the doctor is an atheist who wants to tell his children the harsh realities of his atheist worldview (when you die, that’s all there is). Then, when the supernatural events refute his narrow skeptical viewpoint, he never really questions or seriously investigates them. Secondly, though she believes in a Heaven, the wife has no spiritual, theological or biblical context for that belief. Also, she’s still emotionally and extremely overwhelmed and traumatized by the death of her sister years ago. If you believe in a Heaven, why not believe in a God who can help you find spiritual, moral and psychological inspiration, healing and guidance? Finally, the ending of PET SEMATARY shows the demonic, occult forces behind the mystical burial ground ultimately being victorious. This isn’t just depressing and annoying, it’s also abhorrent. PET SEMATARY also contains strong foul language and extreme, gruesome violence that’s excruciating to watch. Media-wise moviegoers will avoid this PET SEMATARY. Extreme, sometimes gruesome and some strong violence includes a demonically controlled child cuts a man’s Achilles tendon and then stabs him repeatedly to death while he lies in pain on the ground, other people are stabbed to death, teenager with a spinal deformity falls to her death, truck spins out of control and almost hits a two-year-old but it’s implied it struck and killed his older sister, images of corpses (including a couple that’s rather bloody), doctor treats a dying accident victim who’s had some bones broken and half his face is a bloody pulp with his brain partly showing, etc. The 2019 remake of PET SEMATARY changes some major plot details in Stephen King’s book and the original 1989 movie. It still tells the story of an atheist doctor who tries to bring his dead daughter back to life by burying her body in a wilderness burial ground controlled by unknown demonic forces. The doctor’s actions have brutal, terrible consequences for himself and his family. Like its previous incarnations, the 2019 remake of PET SEMATARY is a dark, disturbing occult tale. One might think that’s a perfect tone to set for a scary horror movie about supernatural things, but actually it’s rather depressing and unsatisfying. It doesn’t help matters that the basic story doesn’t make much sense. For example, the skeptical atheist doctor never really questions or seriously investigates the supernatural events that consume him. The ending of PET SEMATARY shows the demonic, occult forces behind the mystical burial ground ultimately being victorious. This isn’t just depressing and annoying, it’s abhorrent. PET SEMATARY also contains strong foul language and extreme, gruesome violence that’s excruciating to watch. Media-wise moviegoers will avoid this PET SEMATARY.